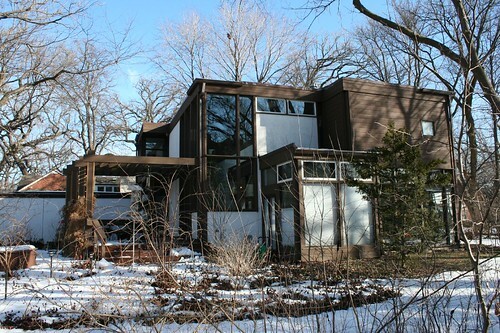 1973 – Pure expressive massing. This house’s interior volumes strain to break free, pushing the facade to the limits of thinness. Every one of those boxes is filled with livable space. 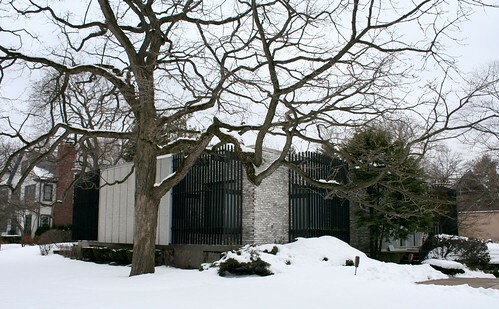 “Ornament” consists of the house’s own volumes, and the interplay of glass with a couple of solid facing materials. Delightful, and it must surely be awash in natural light all day long. 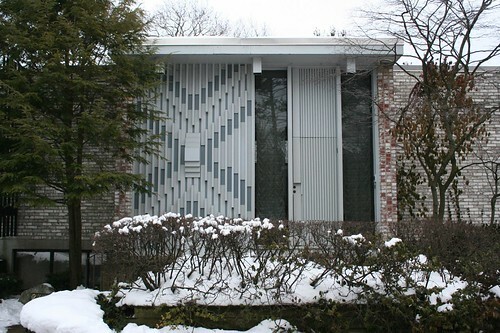 1977 – Everything about this house screams 1960s, from the vertical wood slats to the mixed-color brick, but it evidently came down the pike about ten years later than it looks. That front entry facade is pure art! 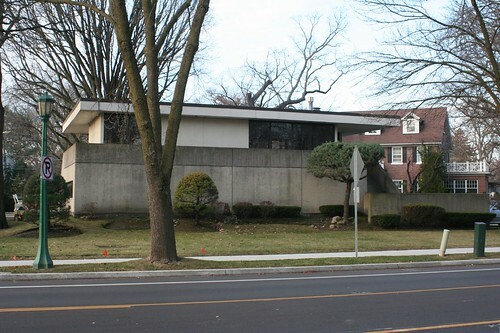 1978 – Next door, this awkwardly realized concrete bunker tries, but just doesn’t have much in the way of poetic massing. The near-total lack of windows just kills it. 1978 – Another fortress in concrete, but this one succeeds beyond all expectations. This elegant house raises the primary living spaces up above the ground – a strategy used 70 years earlier in Frank Lloyd Wright’s Robie House. Up top, the living room (or whatever it is) glows like a beacon at night. Thirty years old now, but it could just as easily be brand new. 1983 – Again, my first guess was late 1960s, perhaps a facade tacked on to an older house. Well, the facade is certainly tacked on, but the house is surprisingly new. 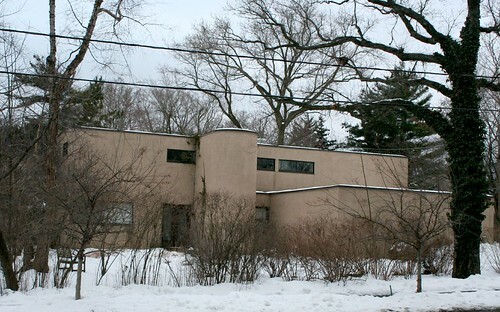 Given the date and the strangely pretentious front elevation, one is tempted to call it a PostModern work. A split driveway (surrounding a planted island!) 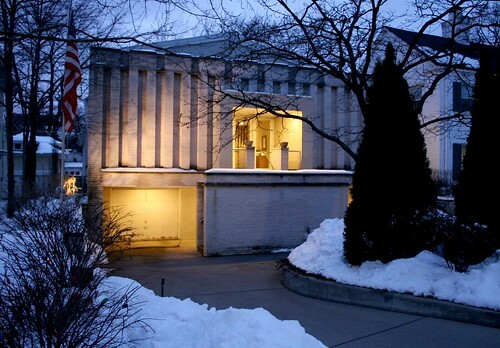 descends to twin single-car garages, with stairs leading up to the main entrance. Miniature grandeur, or a house with its foundations washed out from under it? You be the judge! Robert – Lovely post, and dreamy homes. Some of them have great woodsy settings that really compliment the clean rectangular lines. Reminds me of another favorite North Shore home of my friends' parents, now for sale – 270overlookdrive.com.Congrats on your marriage & travels! I can’t help wonder what these houses replaced. Evanston was once awash in gingerbread cottages, which I presonally prefer. Perhaps one day these brutalist structures will come down to make room for something even less human.